River Gods, a popular Cambridge restaurant and nightspot (seen here in 2013), closed suddenly over the weekend. Here’s a secret: A few years ago, on a buzzing Saturday night in Cambridge, I was in the DJ booth at River Gods, the beloved Central Square restaurant and nightspot. Three songs into my set, I reached for my drink, knocked it over, and the cocktail glass shattered on a metal electrical box. The entire contents of that Manhattan, down to the cherry, soaked the switches and triggered a piercing fire alarm. No one knew how to defuse it. Within minutes, everyone spilled out onto the street, cupping their ears and glaring at the DJ who’d just ruined their night and possibly their hearing. It was my fault, but I was too mortified to tell the truth when asked what happened. Caroline Enright, the general manager, rushed from home to turn off the alarm. She called the fire department to say no firetrucks were needed. And then, looking right at me as she scooped up the wet shards of glass, she said to the dispatcher, “I’m not sure what happened, really, but we have been having some power outages lately.” She covered for me. I’m confessing this now because it neatly sums up what made River Gods a second home to the hundreds, perhaps thousands, who revered it as their favorite bar around town. Actually, it wasn’t a bar; it was a community. On Monday, owner Jackie Linnane stunned the faithful with an announcement on Facebook: After nearly 15 years, River Gods had suddenly closed over the weekend — for good. She wasn’t able to renew her lease. Owner Jackie Linnane announced Monday that the bar was “unsuccessful in renewing” its lease and is now permanently shuttered. They’re not alone in their shock and sadness. In the 24 hours since news broke, River Gods’ admirers have mourned its closure as yet another tear in the city’s cultural fabric. It was the kind of place that even if you never stepped inside, it made an impression as you drove past it on River Street. It was mysterious, with the nondescript exterior of a dive bar, but it was more — so much more — than that. Linnane, who’s from Ireland, transformed the space into a hybrid of a gastropub, a gothic sanctuary, and a friendly neighborhood watering hole plucked from a David Lynch movie. Cambridge’s answer to “Cheers,” minus the sitcom antics and with sexier lighting. It was so larger than life, in fact, that you often forgot its cozy capacity. 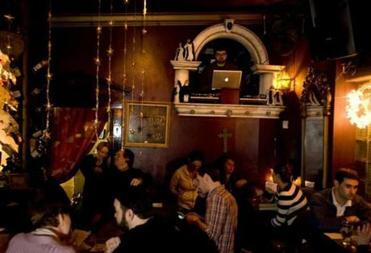 “A small, intimate bar with a giant, generous heart” is how Melissa Farrington, a longtime River Gods DJ, described it in a heartsick Facebook post. Part of its magic was that River Gods took chances with amateur DJs, many of whom got their first taste of spinning music for the masses there and ended up making it a regular hobby — this writer included. There wasn’t room for dancing, but there was plenty of opportunity to discover and connect with all sorts of music, from early rock ’n’ roll and old-school soul to fizzy synth-pop and tribute nights to David Bowie and Prince. A DJ could take chances, really have some fun, and trust that the crowd would go along with you. Say, for example, you were feeling cheeky and played Salt-N-Pepa’s “Shoop,” followed by Cher’s version of “The Shoop Shoop Song (It’s in His Kiss).” No one minded! The staff, who collectively called themselves River Gods and Goddesses, were characters in their own right. Head chef Luke Park whipped up dozens of pizzas, sandwiches, salads, and entrees every night, and still found time to say hello and, if you were lucky, tell a dirty joke. The young men minding the door looked more like poets than bouncers. The female servers were no frills, all sass and efficiency. Visionary Irish women ran River Gods, and their imprints made it a singular destination. Patrons could count on the decor changing with each holiday, often with a dark sense of humor. Around Halloween, you’d see blond Barbie dolls dangling from the ceiling, their bare bodies wrapped in black masking tape. River Gods was an original, a home away from home (a phrase bandied about in numerous online testimonials) whose demise somehow feels personal. James Reed can be reached at jreedwrites@gmail.com.